one of my best friends has been stressing a lot recently over his relationship with his girlfriend. He told me he feels like its falling a part and he wants to get her something to help patch things over. he was thinking a necklace, a ring, or charm of some sort. i was helping him browse all these different jewelry stores and websites. i noticed that a lot of posts have involved rings with the promise directive. i came across this band aid charm and could not believe they actually made jewelry like this. LIKE REAL JEWELRY! 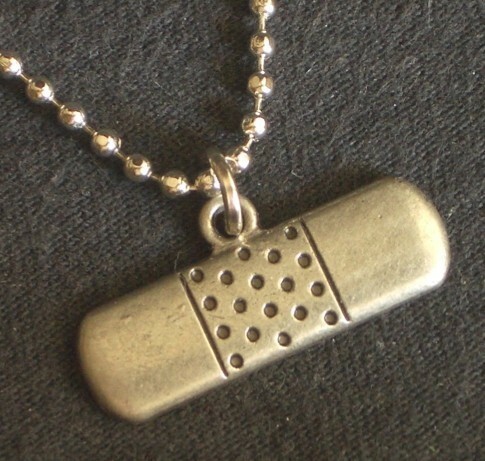 i said here man you should get this and help heal the pain of love bro…. he laughed and said yeah right and i said well i’m making it a post because i have honestly never seen a real band aid piece of bling. it also looks like tough durable metal which would comply with band aid’s trend of being a tough reliable adhesive.